A worming strategy is the method that you choose to use to control the worm burden of the horses in your care. If you know which strategy to use then it makes designing your worming program easier. You can identify which wormers you are going to use and combine them with worm egg counts, if appropriate to fit into your strategy. A worming strategy could include chemical wormers, herbal or natural wormers and worm egg counts. It could also be, although unlikely, that you choose to ignore the threat of worms and do nothing at all. Regular worming is carried out at four to thirteen week intervals (depending on the wormer used). It ensures that horses on yards with a high turnover, or with horse sick and larvae infected pasture do not develop large worm burdens. 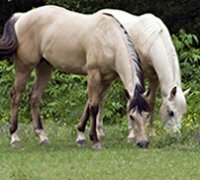 Horses may have low worm burdens and are being given unnecessary wormers, which is a waste of money for the owners of these horses. It is easy to manage for yards with a large number of horses and owners. It may encourage worm resistance to the chemicals being used. It ensures you can protect your own horse from worms even if he shares his grazing with horses whose owners have chosen not to worm at all. If the incorrect wormers are used or the wrong dose is given then it may not prevent large encysted or adult worm burdens developing. Regular worming is carried out but only at the times of year when particular worms are known to be a problem. It reduces the chance of worms developing resistance to the wormers If you reduce the number of wormers and your horse is carrying a high worm burden then he may experience colic. If the incorrect wormers are used or the wrong dose is given then it may not prevent large encysted or adult worm burdens developing. Worm egg counts are carried out and horses are only wormed if they have high results, that is over 200 eggs per gram. The ELISA tapeworm test is carried out annually and horses treated if they have a positive result. It avoids unnecessary worming, which is cheaper for the owner and better for the environment as fewer chemicals are being passed into pasture through droppings. Requires more organisation and knowledge and needs the co operation of all owners on the yard. It identifies the horses that have high worm burdens and proactively reduces it so that other horses are not infected. It can be dangerous if you do not know how to interprete the results correctly and do not take the risk factors into account. Wormers Direct can manage a targeted strategic worming program on behalf of individuals and yard managers. If you would like to start your own horse on this type of worming program but no one else on the yard does then we can take this into account. If you run a large yard or stud then we can incorporate high turnovers of horses. A treatment record is maintained for each horse of all worm egg count results and wormers given. We will monitor all worm egg count results and advise if any treatment is required. The cost of this service starts from £12.00 depending on how many horses are in your care.